NAIROBI, 12 February 2015 (IRIN) - Thousands of children are fighting with government and rebel forces in South Sudan, reversing a painstaking demobilization program and fanning calls for war crimes trials as a better way to protect minors from recruitment. To mark the International Day Against the Use of Child Soldiers, this article examines the dynamics of recruitment and the prospects for sustainable demobilization. Many thousands of children have been killed, wounded, orphaned or displaced since December 2013, when a power struggle between President Salva Kiir and his former deputy Riek Machar split the ruling Sudan People’s Liberation Movement and Army (SPLM/A) and triggered a conflict that still shows little sign of ending. Doune Porter, a spokeswoman for UNICEF, said armed groups including government troops and allied militias as well as an array of opposition forces are currently using more than 12,000 children, and that recruitment is ongoing. The figures are a serious blow to the UN-sponsored demobilization effort begun before the country seceded from Sudan in 2011, and raise serious questions about the effectiveness of such programs: Why was the earlier progress so easily reversed? How can future programs be strengthened? Would high-profile prosecutions deter recruitment? Or are they counterproductive? The UN has led efforts to combat the use of children in armed groups around the world since the turn of the millennium, with mixed results. From 2002, the UN secretary-general has ‘named and shamed’ offending governments and non-state groups in a high-profile annual report on children and armed conflict. Subsequently, the UN Security Council has required those on this list to implement action plans to release children and prevent their future use, as well as to end other “grave violations” of children’s rights, including sexual violence and the armed occupation of schools. Under its 18-point plan, South Sudan deployed over 1,000 child protection officers throughout the armed forces; trained 30,000 military officers on the subject; and ordered commanders to comply with the process or face sanction. 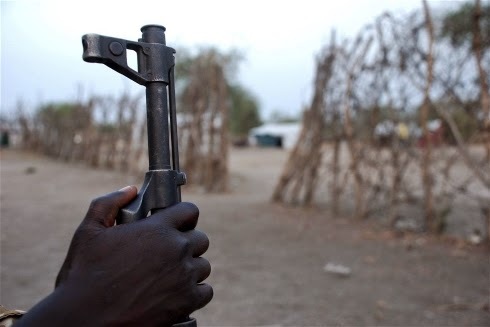 By December 2013, the SPLA had released 955 children and rejected 450 who had tried to enlist. UNICEF helps the demobilized children find their families and begin the often troubled process of returning to school and civilian life. According to Porter, only about 500 children were still serving with the SPLA when the latest conflict broke out. South Sudanese officials insist they are still committed to the process. In October, the government adopted the UN-sponsored “Children, Not Soldiers” campaign to end the recruitment and use of children by government security forces in armed conflict by the end of 2016. In January, a former rebel militia released 250 children under the program, eight months after making peace with the government. More than 2,000 more are expected to demobilize from the group – the South Sudan Democratic Army Cobra Faction - in the coming months. But no more children have been released from the SPLA’s own units. He insisted most of those who remain are cooks, porters and cleaners rather than front-line troops, and said he was optimistic the demobilization process would eventually resume: “The South Sudan army wants to get its name removed” from the list, Holt told IRIN. Meanwhile, the recruitment of minors has resumed. “There has been a lot of difficulty getting the messages down into the more remote command areas and so some units have been recruiting children, despite the direction from the central command not to do so,” UNICEF’s Porter said. While neither the UN nor the government are providing any detailed figures, the problem may well be greatest on the opposition side. Last May, Machar signed a commitment with the UN to immediately end all violations against children. Many opposition commanders have been through the same education process in the SPLA before they rebelled. However, Machar has repeatedly stated that he doesn’t have full control over opposition forces. These include the so-called White Army, a loose collection of ethnic Nuer militias believed to include thousands of minors. Some observers argue that, for powerful historical, cultural and economic reasons, the setback over child soldiers was inevitable once conflict re-surfaced, and that only a patient co-operative approach will bear long-term fruit. Thousands of children were recruited into the SPLA and other groups who fought in the decades-long civil wars that ultimately led to the independence of South Sudan. South Sudanese minors are often familiar with weapons, including boys routinely sent off to guard livestock against raids from rival communities; and both boys and girls are widely viewed as adults once they reach the age of 15. While those factors could take a generation or more to overcome, the action plan agreed by the government also includes a commitment to investigate and hold accountable perpetrators of grave violations against children – a measure aimed squarely at commanders and leaders and meant to deter backsliding, whatever the circumstances. To that end, the UN has helped train SPLA judges to stiffen the army’s internal justice system. Children’s rights have been enshrined in law. However, rights groups complain that South Sudanese legislation proscribing the recruitment and use of children remains weak and that no high-profile commanders have ever been prosecuted in either a local or international court. Skye Wheeler, South Sudan researcher with Human Rights Watch, said that lack of accountability represented a fatal weakness. “No commander in South Sudan has ever had to pay any kind of serious cost for the use and recruitment of children. There’s never been any justice,” including for a string of pardoned former rebel leaders integrated into the SPLA, Wheeler told IRIN. “So of course it is unsurprising that, when you get a conflict (and) commanders are under pressure to recruit large numbers, as well as forcibly recruiting thousands of young men and middle aged men, they also take hundreds if not thousands of children,” she said. “Where amnesties must be used for the sake of peace, stability or demobilisation efforts, we recommend that they exclude war crimes, including the recruitment and use of children in hostilities,” Guitard told IRIN by email. She said Child Soldiers International’s partners in eastern Congo were finding that the 2012 conviction of militia leader Thomas Lubanga before the International Criminal Court was persuading commanders of some armed groups to release children from their ranks in the hope of avoiding prosecution. In South Sudan, the prospect of political or military leaders facing legal consequences for the use of children or other crimes committed during the current conflict appears remote. Most recently, rights groups have criticized a decision by the African Union to delay the release of findings from an AU investigation into crimes committed in the first months of the conflict – apparently out of concern that it could upset efforts to mediate a peace agreement that would see Kiir and Machar share power. But for Holt, who has spent more than a decade trying to return young fighters to civilian life, the only real hope for South Sudan’s children is an end to its chronic instability, so that minors can go to school and avoid the pressure to pick up a gun. “As long as there is no peace in South Sudan, children will be seen carrying weapons,” he said.